When it comes to choosing a development partner I feel the most relevant differentiators are the people and the philosophies embraced by each company. While my processes, which are presented here as well, were developed to facilitate communication and promote accountability thus rendering delivery more efficient, it is my focus on the people involved in those processes that leads to the successful production of useable solutions. my first step is always getting to know you, your people, your business and determining how best I can serve as your development partner. If you are ready to expend capital, there must be a problem that needs addressing. Who is having the problem and what is their job? How are they currently doing their job? What is the ideal solution? By combining the answers to questions such as these with a thorough understanding of the environment into which the solution will be deployed I can begin the process that is the Software Development Lifecycle (SDLC). Fittingly, the most important step in that process is the first major step; the gathering, formalization, and validation of the system requirements. 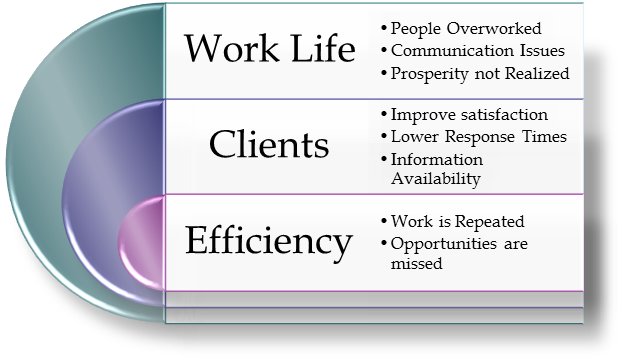 Combining the results of my Day in the Life requirements gathering concept with my intimate and expansive knowledge of across the technological spectrum, I deliver not just software solutions, but problem resolutions. My goal is simple; to provide technologies which truly benefit the company that has paid for their development. From the work-lives of the people who will use them to the financial health of the group from whose budget the allocation was made, I work to solve the problem. To achieve this goal, from the initial discussions I consider factors such as possible barriers to adoption, training costs, localization issues, and solution championing. 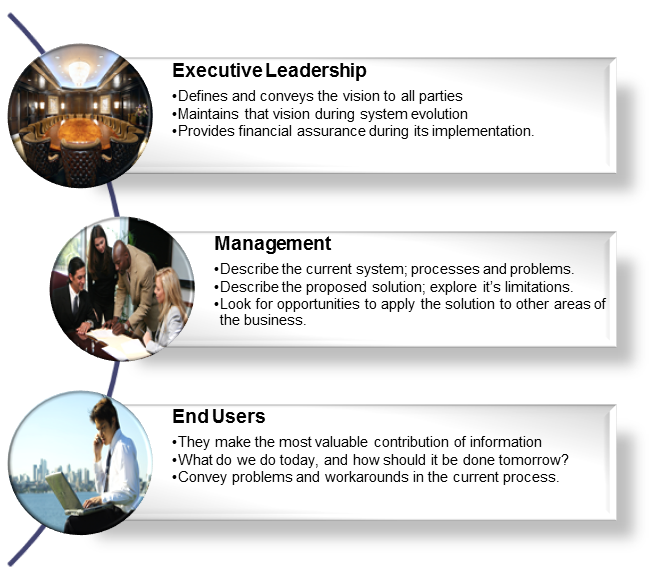 The roles during and contributions to the early stages of SDLC by the executive leadership and senior management are well known. However, my experience has shown that it is beneficial to bring in the end users, not just their management, early on in the process. I have found that their contributions lead to increased satisfaction which in turn drives adoption thus improving the overall chances for success down the line. It is common to list communication and process as the most important factors in a successful effort, but my management team understands that people are the most important thread. From the people within your organization who will ultimately use the solution to the people within my company who will deliver it; I feel focusing on people is the key to any project’s success. Next in line for us is knowing exactly what needs to be done before I start spending your money and time. 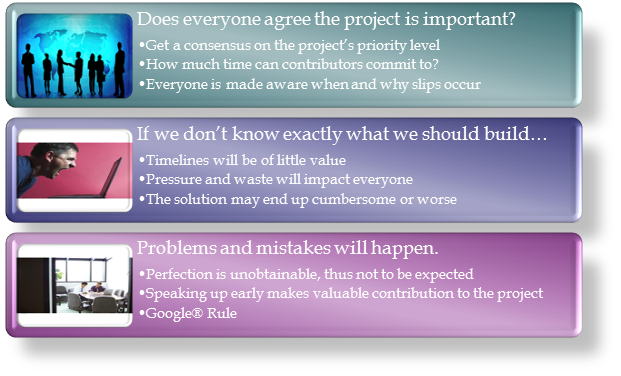 This starts with gauging everyone’s commitment to the project. I have found it very revealing and critical to ask for the opinions of everyone who will be involved in the project’s execution. Identifying decenting opinions may reveal areas where special provisions may be helpful. I also ask that people make regular time commitments at the beginning. This includes those responsible for financing the work to keep them informed of the overall progress so they aren’t caught in complete surprise in the event of overruns. The most important aspect of a project is defining exactly what needs to be built… Yet this step is often misunderstood, poorly executed, and even overlooked. “No single factor is responsible for more wasted effort, rework, or failed projects than inadequate requirements"